It’s that time again. I’m skating in another bout. This time I’m co-captain of my team. It has tapped into all of my dormant director skills and –unpredictably– has resulted in me jonesing to get back on stage. It has also resulted in me giving some long-winded, overly-emotional locker room speeches about teamwork and dedication. No, it really has. I don’t know what’s wrong with me. I think my dad made me watch Hoosiers too many times growing up. If you can’t make it to the Doll Factory because you live far away and/or you are lame, you can watch the LIVE WEB BROADCAST. This thing is neat. Seriously, don’t miss it. You can watch the live feed of my game Sunday, November 15th, starting at 3pm Pacific. Watch the Live Feed — Sunday, November 15th, 3pm Pacific — RIGHT HERE. Buy Tickets HERE to come see the action LIVE! Doors open at 3, we skate at 4, we win by 6! 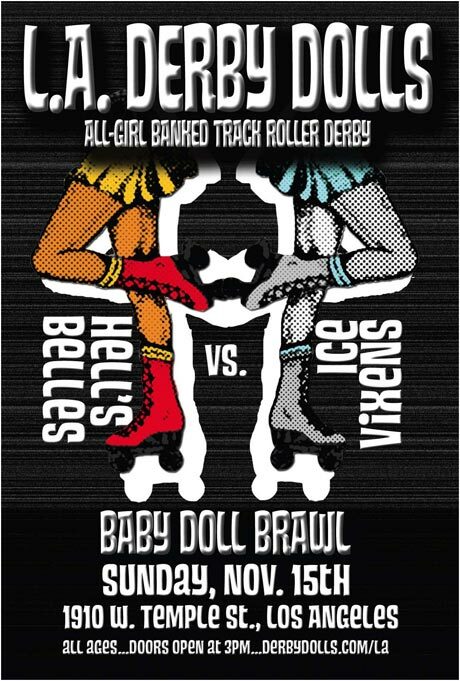 Bring the whole family to the Factory on Sunday for the bi-annual Baby Doll Brawl. This daytime, all-ages event is an exhibition bout for the league’s newest skaters and notorious for the most gruesome hits. Scope out the up-and-comers before they’re drafted – this is your sneak preview of the 2010 season! Don’t miss the half-time mini-bout featuring pint-sized skaters from the L.A. 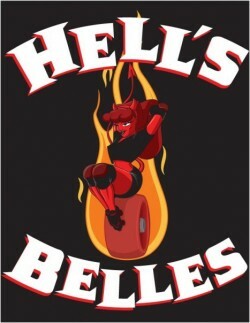 Junior Derby Dolls. Fans will be rocking and rolling to bass n’ drum rock duo Evil Beaver, who will perform at halftime. Derby Dolls events offer a full range of entertainment off the track, with the Vendor Village featuring art, jewelry and clothes, food from Garage Pizza and Hot Dog on a Stick; wine from Paso Creek; beer from Tecate and Alex’s Bar. The L.A. Derby Dolls are one of only five leagues in the U.S. playing roller derby on a banked track. Like most modern female roller derby leagues, the Derby Dolls are volunteer-run and give back to the community that has embraced them. Next Article halfway through this excellent stack.